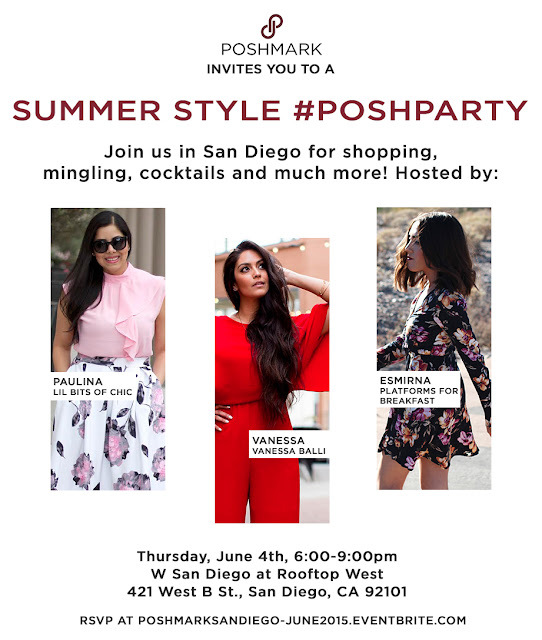 Poshmark is coming to San Diego and hosting a live Summer Style #PoshParty at the very hip W Hotel San Diego rooftop and San Diego Style Bloggers are invited! Come mingle with the cohosts (fashion bloggers Paulina of Lil Bits of Chic, Vanessa of Vanessa Balli, and Esmirna of Platforms for Breakfast) as well as Poshmark's CEO and the Poshmark team. If you are not familiar with Poshmark, it is a virtual marketplace app on your smart phone/tablet where you can shop countless of closets and also sell your clothes/shoes/accessories. Read more about it here! There will be cocktails, raffle prizes, a virtual Poshmark party on the app, great company and of course a stylish ambiance. Come dressed in your best Summer Style attire! Whether that means a pair of gorgeous sandal heels or a bright summer dress, it will be the perfect place to showcase your amazing style. Did I mention tickets are free? Get your ticket by clicking here! Space is limited so hurry and snag your spot. Last chance to RSVP is June 3rd at 11:59pm if tickets are still available. The beer selection at this place was great and rotates often. Everyone who works at party venues Houston TX makes you feel welcome. They remember your favorite drink and you will be glad to tweet about them.